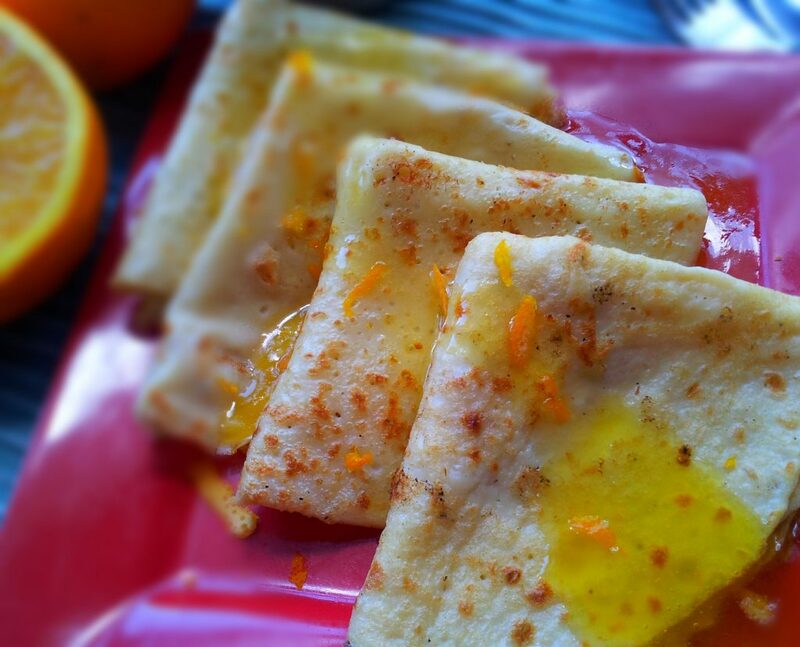 Egg Free Pancakes with Sweet Orange Sauce is a delicious way to start or end the day. I mean how many breakfasts can you turn into a dessert and vice versa….not many right? 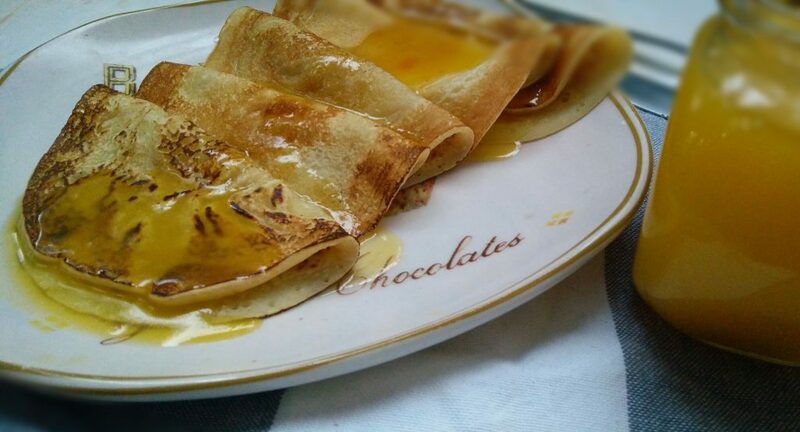 Pancakes are so versatile, that you can prepare it either as a breakfast or dessert. You can really let your imagination run wild here with the different type of toppings, syrups and sauces which you can use on pancakes. 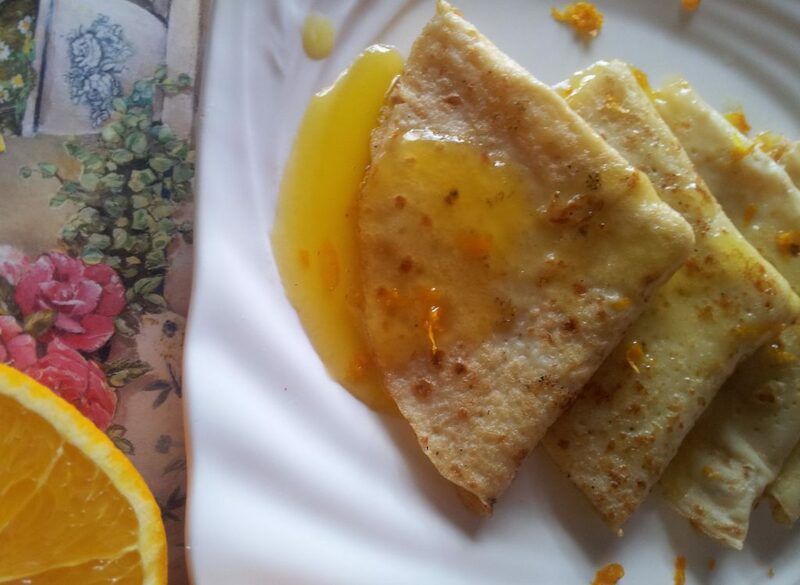 These pancakes with sweet orange sauce however, has won the award of deliciousness in my kitchen. It is a great alternative to maple or golden syrup. 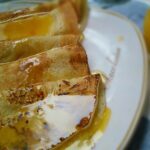 Sweet orange sauce drizzled on warm pancakes is really one of our favourite toppings, which I am going to love sharing with you. I have actually used this recipe for both, breakfast and dessert. For breakfast, I usually add a sprinkling of cinnamon sugar. For dessert, I like adding on a scoop of vanilla ice cream with a bit of grated orange rind. Both ways are absolutely heavenly. The batter and sweet orange sauce is super simple and super quick taking under 10 minutes prepare both. Cooking the pancakes is also done in 10 minutes. So if you are looking for a delicious, quick to prepare breakfast or dessert, here you have it! Start by making the orange sauce, by heating on medium heat 125ml/ 100g sugar, 15ml orange rind, 150ml freshly squeezed orange juice and 100g margarine in a pot. Stir constantly until the sugar has dissolved, about 4 minutes. Add about a ¼ cup of this heated mixture to 15 ml of cornflour and mix well. Pour it back into the pot and bring to the boil. Whisk continuously, for about 2 minutes until thick and smooth. The reason for not adding the cornflour directly to the pot is that, it will not dissolve well and will form lumps in the sauce. Adding a small amount, like a ¼ cup of the heated mixture however, forms a smooth paste and when this is added back to the pot, creates a smooth, lump free sauce. Next, make the pancake batter, by sifting 1 cup of cake or all-purpose flour and a ¼ teaspoon of baking powder into a bowl. Stir in ¼ cup of sugar. Make a well in the center and add 10ml/2 teaspoons of canola or sunflower oil and 1¼ cups of milk. You could add in ¼ teaspoon of vanilla essence if you prefer. Whisk or beat well with a blender until smooth. You can either use cooking spray or lightly oil a heavy based non stick pan. Using a ladle or spoon, pour out the batter into the pan. Spread it into a circle with the back of the ladle or spoon. Flip the pancake when you see little bubbles forming on the surface. Cook until lightly browned on each side. Cook for about a minute on each side. Drizzle the warm sauce over the cooked pancakes and add a sprinkle of cinnamon sugar or serve with a scoop of ice cream. JUST A WARNING… This is intensely delicious and addictive so it might be a good idea to double just the pancake part of this recipe… in other words, MAKE LOTS! Start by making the orange sauce, by heating on medium heat sugar, orange rind, freshly squeezed orange juice and margarine in a pot. Stir constantly until the sugar has dissolved, about 4 minutes. Add about a ¼ cup of this heated mixture to the cornflour and mix well. Pour it back into the pot and bring to the boil.Whisk continuously,for about 2 minutes until thick and smooth. The reason for not adding the cornflour directly to the pot is that,it will not dissolve well and will form lumps in the sauce. Adding a small amount, like a ¼ cup of the heated mixture however, forms a smooth paste and when this is added back to the pot, creates a smooth, lump free sauce. Next, make the pancake batter, by sifting 1 cup of cake or all purpose flour and a ¼ teaspoon of baking powder into a bowl. Stir in ¼ cup of sugar. Make a well in the center and add 10ml/2 teaspoons of canola or sunflower oil and 1¼ cups of milk. You could add in ¼ teaspoon of vanilla essence if you prefer. Whisk or beat well with a blender until smooth. You can either use cooking spray or lightly oil a heavy based pan. Using a ladle or spoon, pour out the batter into the pan. Spread it into a circle with the back of the ladle or spoon. Flip the pancake when you see little bubbles forming on the surface. I have to ask………. 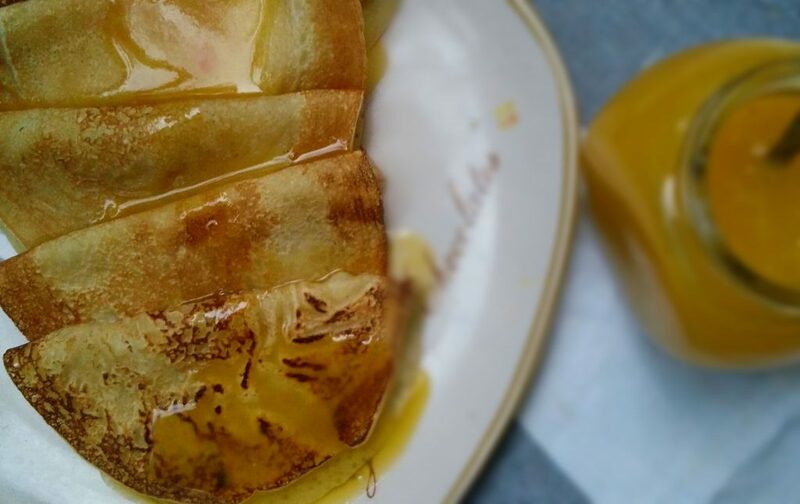 Are these pancakes or crepes? I hate pancakes but love crepes. I know…… but I just don’t like the texture and cakeyness of pancakes. Hi, yes this is pancake recipe, but if you do want crepes, leave out half the flour and leave out the baking powder as well and spread out the batter a bit thinner. Use cooking spray or a good non stick pan to ensure that they do not stick to the pan. Let me know how they turned out. You are absolutely welcome ?. Have a great day as well.